The Shadow of the Wind opens in mid-centry Barcelona as Daniel Sempere and his father visit the Cemetery of Forgotten Books. Daniel is allowed to select one book with the condition that he must serve as the book's steward for the rest of his life. He becomes enthralled with the story and the author, Julian Carax, and sets out to find more of Carax's work. These efforts, however, bring him the unwanted attention of a man named Lain Coubert, whose sole purpose is to destroy all memory of Carax. Daniel must unravel the mystery shrouding Carax in order to protect his book, which turns out to be a complicated and dangerous task. 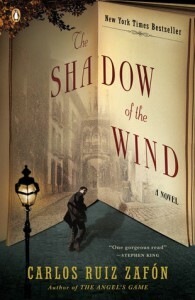 The Shadow of the Wind is a book-book; a self-referential book in the best way. It contains elements of mystery, gothic, romance, noir, and adventure, all with a heavy dose of humor delivered through the character of Fermin. The language is a bit flowery, which took some getting used to, but once I adjusted I enjoyed it immensely. It's a fun read that book lovers of all sorts will enjoy, provided they don't take themselves TOO seriously. I somehow never heard of this book until a coworker gave it to me for our Secret Santa exchange (thanks Diane!). She gave it a glowing review and might just be Carlos Ruiz Zafon's biggest fan. But, aside from her praise, I didn't know much else - nothing of the plot or the broader hype that surrounds it. And...I loved it. I was along for the ride and having so much fun. I had a sneaking suspicion pretty much right off the bat for how the main plot would end up, though there were bits and pieces that I wasn't sure of. I deliberately ignored my theory, though, so that I could enjoy the story and the various subplots. Zafon establishes the characters and sets the scene quite well. It's one of those books that feels like a movie is screening behind your eyelids as you read. And Fermin made me laugh almost every time he opened his mouth. I would recommend this for book nerds and anyone who's in need of a mood boost and wants a good story while they're at it.